Saturday morning we woke up bright and early to head to the first MandaStrong Foundation 5k and Fun Run. Dave had a bit of what the rest of us had had earlier in the week and so he wasn't able to make it so my mom filled in and joined me and the kids. Waiting for the fun run to start and one of my FAVORITE things ever happened - can you see those sun beams waaaay off in the distance??? LOVE! So so so proud of the MandaStrong Foundation and all of the work they did to pull of such a huge event with an incredible turnout. After the race we grabbed some breakfast, headed home to check on Dave and then went to Mason's last football game of the season. Griffin was going to make the most out of the pom poms while she had them (we borrowed them from McKinley) and so she brought them to the game to cheer for her brother since the first grade cheerleaders invite the little sisters up to cheer with them. SO SWEET! Y'all. My heart. 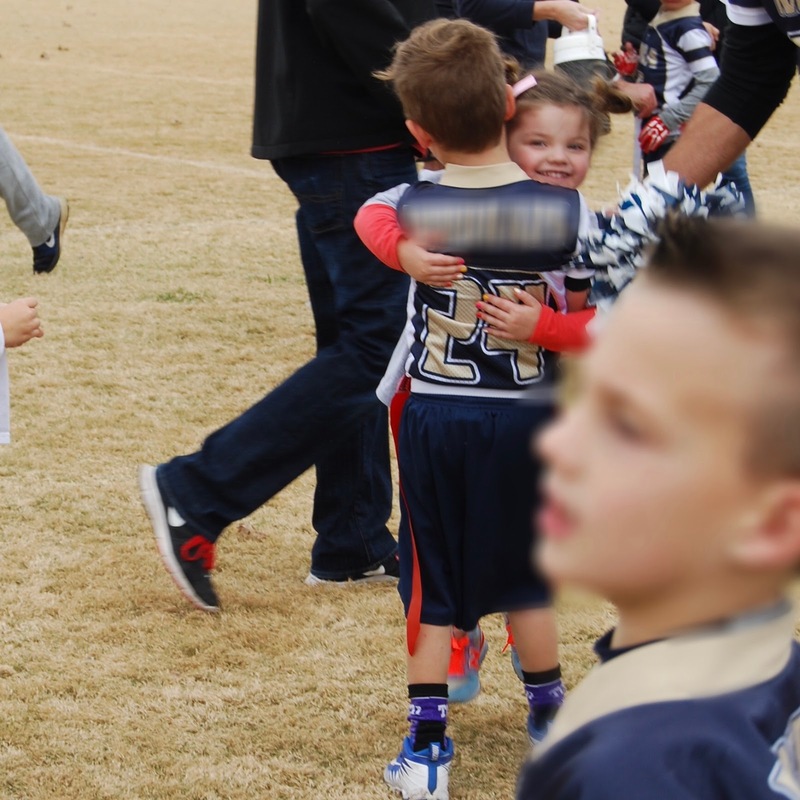 Griffin LOVES her big brother's friends and I love how sweet they are to her! After the game we had the end-of-the-season party, Mason went home with a friend and these two and I made a much-needed grocery run. They were holding hands - SO CUTE!!! And I snapped a picture because even though it warmed up a bit that afternoon it was officially beanie weather during the football game. BEANIE WEATHER, friends!!! Who is looking WAY too big for my liking these days! Sunday afternoon we had Mason's friends over for the afternoon and it was the best. We just played and hung out and drank Starbucks and it was exactly what we all needed. We ran around, explored and played hide and seek. Sunday night we cleaned up the kids rooms, got ready for the week and moved some things around in the playroom to add this bookcase and make room the the kids Christmas tree. It was quiet and slow and perfect. I hope that y'all had a restful weekend and have a great week planned ahead. We're ready to power through to Thanksgiving break next week! Don't forget that tomorrow is Show and Tell Tuesday and we're going to be talking about giving back - I'd love for you to join in! PS - this post contained a couple of affiliate links - thank you so much for reading and supporting my blog! Mason in that hat. That's all I have to say. You know how I feel about Mr. Mason :) . Those chargers are so nice! I need to check those out. I love the gold rim, because it dresses them up a little. Have a great weekend and get some rest!! How do you like the white plates? I'm looking to buy a new set. I have had the same set since our wedding 17 years ago with fruit around the border. I'd like to get something simple! Yay!!! So glad you made it to Friday! Woohoo! Glad you made it to Friday, friend! You have had a long week! I totally want to jump in jammies and order pizza tonight too but we have birthday parties to attend *sigh* G's turkey/cat is adorable!! I love her creativity! Griffin's new kicks are adorable!!! I want them in my size. Have a blessed weekend! So glad you are feeling better! Being sick when you're the mama is rough. I can't wait for my Christmas card email, but I know you've got so much going on. Rest up! I love tea too! Also that cardigan is amazing. Not sure if you have that blue wrap style MJ one yet but that has the chunkier knit too. Wish they made it in more colors! Where did Griffin's green skirt come from? So cute. Oh my word...I bet your heart nearly exploded with love when that cute little Mason knocked on your window. That is the sweetest!!!! Happy Friday! Lots of goodness in your week. So many favorites! I love GG's turkey/cat and the kid's slippers made me laugh out loud:). Happy Friday, Andrea! Please let links open up in a new window! How precious is that little outfit that GG picked out herself?! She's got a great little sense of style! Glad you're feeling better. Have a great weekend! That is me but coffee instead of tea! I've heard nothing but amazing things about the Manda Strong event on Saturday! I'm so bummed we weren't able to make it. But next year I'll be beside Griffin with some pink pom poms! What a wonderful weekend!! It was the perfect mix of fun and cozy. I’m just wondering...can I shop Griffin’s closet for myself?!?! She is always so stinking adorable! What a sweet weekend!! I am still loving those new shelves! Happy Monday, friend! I love your shoes when you are on the bench at the park. Where did you get them? Looks like you had a great weekend! I love your purple hoodie. Where did you get it? What a fun weekend! I love all the pictures you took! I love your Faith over fear hat! Where is that from? So glad you guys were all about to gather to remember Manda. I just looked at that bookcase yesterday....loving the way it looks & the price is perfect. I'm assuming if you put it in your kids space you feel like it's pretty sturdy.